Join Up to receive emails on new episode releases and other great announcements! Hello out there in listener land, this is Romy bringing you another episode of the Bonfires of Social Enterprise. 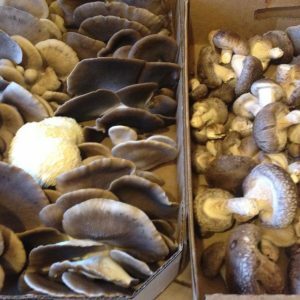 This episode is all about mushrooms! 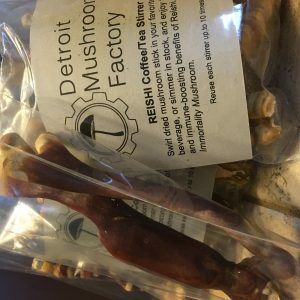 Did you know there are all different types of mushrooms that can be grown indoors, and, that there is a mushroom factory in Detroit? Well, you will meet Deana and Chris and hear all about their story from concept to now. As customary, I also like to introduce a song from a Detroit artist at the end of each episode so stay tuned to the end. Okay, let’s see what Luke has for our fun fuel today…..
Hi, this is Luke Trombley, and I am bringing you the fun fuel for this episode. Did you know that there are over 30 species of mushrooms that glow in the dark? The chemical reaction involved in this is called bioluminescence which produces a glowing light known as foxfire. Some people will use this fungi to light paths through the woods. Thank you for listening to this fun fuel. Enjoy the episode! Very nice Luke. Glowing in the dark….what a fungi….ha ha. Okay, Romy, enough with the bad jokes. Let’s listen in to what Deanna and Chris are up to and how this all began. Okay, great. 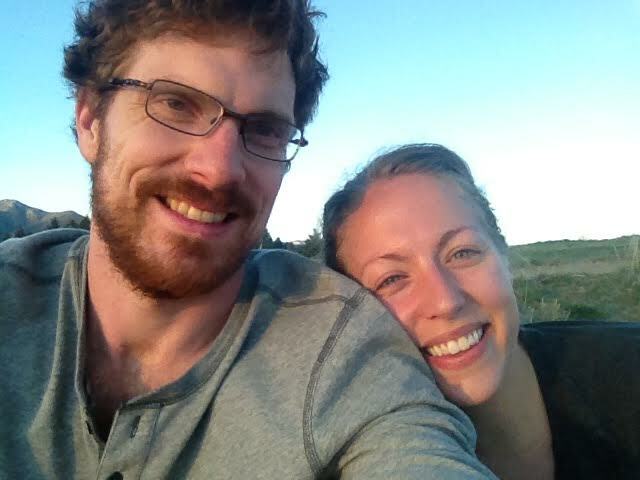 Well, welcome Deana and Chris to the podcast, Bonfires of Social Enterprise. Got your cool business here. Let's talk about the Detroit Mushroom Factory. Great. Well thanks for having us. To just give a little background, we are a mushroom farm. We grow right now just out of our home. We live in Detroit, and we grow mushrooms in the basement. We grow on a substrate that comprises spent brewery grain that we get donated to us from a brewery in Detroit called Detroit Beer Company, and we mix that with sawdust that we get donated to us from a local woodworker named Richard Ganas. And so those two things we combine, we add mushroom spawn, and then we grow those mushrooms and sell them, mostly to local restaurants. Wow. Let's go over that one more time just in case, just for terminology. So you grow the mushrooms in your basement on, what was that? It was a bent ... Say that again. Spent brewery grain. So when beer is brewed at a brewery, they are left over with all this grain that comes out of the mash tun and that's usually a waste stream [inaudible 00:01:26]. So our model, one of the aims of our business is to be a totally sustainable farm. And so we have committed to only growing on recycled materials and spent brewery grain is one of those materials. Okay. Brewery grain, just for those listening in other languages. Okay. And then the sawdust. Okay. Wow, that's amazing. Do you need a lot of room for that in your basement? Well, we don't have it. I was just going to say; we have one of these old houses in Detroit. It's a four bedroom house, and it's just Deana, myself and our dog, so we really have three bedrooms and a basement and part of a backyard dedicated just to the mushrooms. So it does take quite a bit of space, I would say. It takes quite a bit of equipment, and it's a little more complicated on the front end than maybe your traditional farming or your gardening because it requires equipment. For instance, we take that [inaudible 00:02:34], which is usually barley, from the brewery, mix it with the sawdust and then we need to sterilize it. So the mushrooms grow in these special plastic bags that are sterilized. And so we do that in these autoclaves that are basically like big pressure cookers, and then we move that whole operation into one of our bedrooms, which has been set up, basically like a clean room, like a lab. And so nature really does not like sterile environments. It does not like cleanliness, so we're constantly fighting things like mold and things like bacteria. Nature really likes chaos, so it's always fighting us. 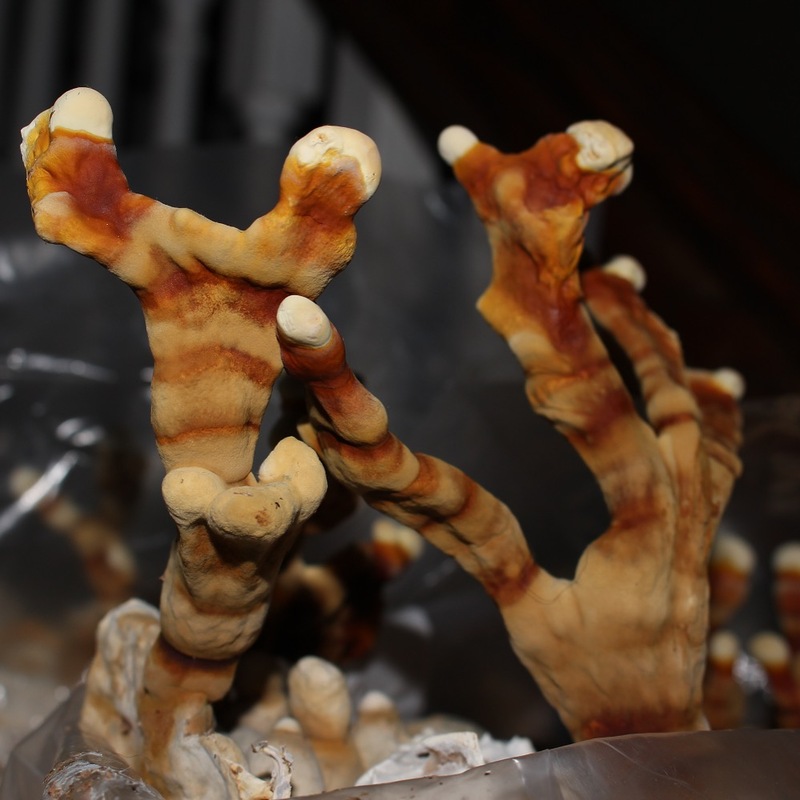 We want to grow our one particular mushroom where nature wants us to grow all kinds of molds and things that are always trying to get in the way. That's so fun! All right. So the end product is the mushrooms. How did you guys originally come up with this? I met you, what? Was it three years ago? No? Four? Yeah. Three years ago, I think. 2014 is when we were in our build social class and in the markets I met you. We had the intention of starting a business when we moved to Detroit. We had both had careers in other sectors and were looking for a change. And we actually left where we were living in California and drove all around the country looking for where we wanted to live next. So we lived out of our car for about nine months and just toured around, went to different cities that people recommended to us, went to different towns and Detroit really stood out. We really loved it here, and once we decided to settle here, we thought, "Well okay. Maybe this is the place where we can try a business experiment." And Chris has had a lot of mushroom growing experience, even before we were in Detroit, that maybe he can talk about. Yeah, let's hear it, Chris. Sure. Yeah. I had grown mushrooms just as a hobby. I'm a person who takes hobbies way too far. So when I was in California, I got a little interested in growing mushrooms, I think I ordered a kit. And so you buy these kits online or wherever, you can get them in grocery stores now, where basically you make a little slit in a bag, and then you get mushrooms growing up. And they worked great. But my brain immediately went to like, "Well, I can't just keep buying kits. Now I need to figure out how to make my own kits." Or something like that and so I just started learning and buying equipment. And little by little, the apartment I lived in started getting totally filled with mushroom grow bags and the entire place was just set up for growing mushrooms. It was my living space and my lab, and it's not that different from how we do it now. Yeah. But that's when we were first getting to know each other. So as a perspective [inaudible 00:05:19] mate ... When Chris and I first started dating, I went to his house, and a few flags went up because there were mushrooms growing out of phone books and there's an old trunk with mushrooms growing out of it. He won me over, he did. He made me a delicious dinner out of mushrooms that he had grown himself and so he won in the end. But it was a lot to take in at the beginning. People talk about when they're kids; they want to be a fireman or an astronaut or whatever. I wanted to be a mad scientist. I would take everything and mix it together. I took all the chicken poo and all the whatever, all the mouthwash and I mixed it together. Luckily none of it was ... there was no bleach and ammonia or something. But I wanted to mix everything together and see what would happen and entirely nothing happened. Now that I've gotten older, I think the mushrooms really rekindle that because, like I said, it's difficult in some ways, but it requires a lot of really weird equipment, and it's just strange in a lot of ways. So it just tickles me in that way, in that same mad scientistic way. When we got to Detroit, we were really taken with how much urban farming is going on here, and that was part of why we fell in love with the city. And when we were conceiving of our business, we wanted to find a way to fit into that urban farming community without directly competing with other growers, because it's hard to make your living growing kale and there's a lot of people trying to do it. And so it felt like we had this unique way to fit into the market because there aren't really other people growing mushrooms for commercial sales within the city. And so that felt like our niche and Chris had the experience, we had some of the equipment. My background was as an educator, so I quickly wanted to learn as much as I could and help other people understand the process and it just kind of snowballed from there. Now we have a house filled with mushrooms. And it sounds like you've got some customers. You said restaurants are starting to buy them, right? Yeah. We've been so overwhelmed and grateful by the support of the restaurants in the city. From the very beginning, really before we had our act together before we were taking ourselves seriously as a business, we kind of sheepishly mentioned to a couple of restaurants that we liked to eat at that we were trying to be a mushroom farm. And immediately they just open arms, welcomed us, said they would buy whatever we had. So we've had some really loyal customers from the very beginning. Rose's Fine Food has been buying our mushrooms since before we had mushrooms, basically. Their owner, Molly Mitchell said, "Whatever you have I'll buy." And they've been so supportive and so patient. Sometimes we have them; sometimes we don't. And then as the local food landscape has grown even more in the city, other restaurants have gotten in touch and been interested. Sister Pie uses our mushrooms sometimes, Brooklyn Street Local is a very committed customer. We sell through Grown in Detroit, which is a co-op of growers at Eastern Market. So we've been really lucky. We have a lot of different outlets, and people seem willing to go that extra mile to support local farmers, and that's why we're in business. Yeah. Wow, that's a good word. This is an odd question from somebody who doesn't understand your business, but does anyone have any trouble with the fact that you're growing them in your home? Because usually, it's probably better than just out in the random woods, right? Yeah, I was just going to say, people certainly self-forage mushrooms. It's an entirely different set of skills. Foraging mushrooms and identifying them is really, really complicated in its own way. So the way we grow right now is, it's a business on the way to becoming a business. We came in with maybe the most important quality for new business owners or new business founders, which is, we were utterly naive about how difficult it was going to be. And we often talk to each other, and we say, "If we knew all of what we have to deal with now then, would we have even have done it?" Because a lot of what we're trying to do now is grow. So we grow in our house, but we're not producing at nearly the level we need to really have a business that can support our demand and ourselves. So we also have this warehouse that we purchased two years now? A year ago? Also in Detroit. Last July. About five minutes from our house, in the north end of Detroit. About five minutes from my house, in kind of the North end of Detroit. 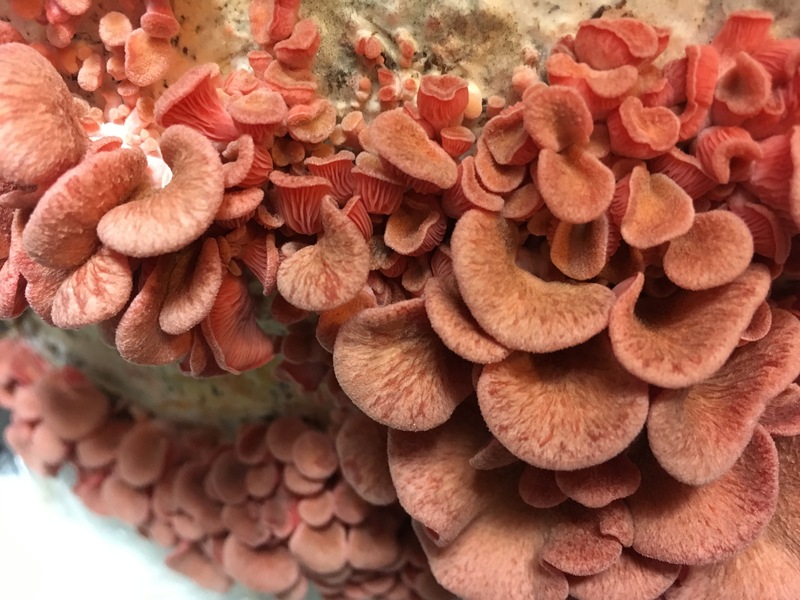 And so now we're trying to move basically from a large, hobby farm into a small true production farm, and just learning so much about the challenges that that poses, and very few of them so far are about growing mushrooms. It's about developing this building that's seen better days and growing, just continuing to grow, be aggressive. Yeah, that's so good. I love what you just said. I mean while you're growing mushrooms, you're trying to grow your business. It's like, there's always more shenanigans that happen than just the running the business part than I think people understand. It's just everything from the financial part, to operations, execution, marketing, communications, and I mean, oh my gosh, what about customer service? So it's like everything. It's a lot when you're a small team trying to scale at least even just to the next step. How little of it ends up being like ... I'm a software engineer, that's my background, so I'm technical. I want the problem ... 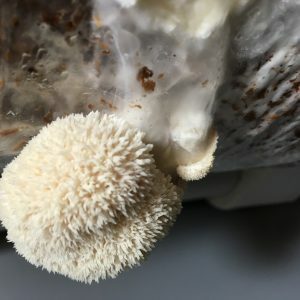 I wanted to grow better mushrooms, and it's amazing how little, at least early on, that is the problem. It becomes ... it's about running a business that's [inaudible 00:11:22] more so. Your passion takes you to a certain point and then you have to say, "Okay, now I gotta like do my books, and I gotta do the taxes, and we have to find funding, and we have to ..." All these things that are ... it's definitely not what I thought of when I was when we were first getting started. It's like, no, we're going to spend our days just [inaudible 00:11:37] keeping mushrooms, trying to grow better ones, and quality, and all this, and it's like ... you just get [inaudible 00:11:43] by so many things [inaudible 00:11:44] focusing on any one thing is very difficult early on. Yeah, I'd ... well ... I think one of my partners spent about two hours this morning trying to get a form corrected in the state of Michigan from our payroll department that they messed up, so, yeah. That's nothing to do with ... it's just the shenanigans of business sometimes. Well gosh, let's go back to the mushrooms. Go ahead. Oh, I was just gonna agree with you that it ... I'm ever surprised at how often things come down to a misspelling on a form or a form being filed in the wrong place so ... I can really connect to your colleague on [crosstalk 00:12:22]. Yeah. Yeah, she's like, "Geez, it's only 10 AM. I feel exhausted from this, and we didn't even do it." So, yeah, so it's funny how all that has ... you just need an enormous amount of endurance to get through those kind of things so you can spend the time doing what you love. So let's go back to those mushrooms. I was gonna say, so what is sort of the grow cycle for a mushroom? Like how long does it take? Tell us more about the mushrooms. So we ... well. You want to take this one, Chris? You're the mushroom guy. You should take it. I'll start, you can jump in. So I mean people ... the kind of questions we get often are where do you buy your seeds? And do you just plant them in soil? Things like that. Growing mushrooms is entirely different from growing crops in soil, growing plants. They're an entirely different kingdom. Instead of planting a seed, waiting for the plant to grow, and then harvesting whatever the fruit is, what we do is, we use the mushroom tissue, which we might have on a petri dish or something like that, and we put that into the substrate, which as we said is sterilized barley and saw dust, and then basically wait. And the mushroom tissue actually clones itself and colonizes the substrate and then actually consumes it. So as opposed to a plant that kind of spreads its roots and maybe takes certain minerals, mushrooms are the great decomposers. So they are breaking down the ... they're like an external stomach. The part of the mushroom that you see, the actual mushroom is really just like the fruit, is like the apple on an apple tree. The tree itself is all underground, and it's breaking down substrates, breaking down wood, or whatever the particular species likes to eat. So, first we let it colonize on these bags, it gets completely colonized, and then we move it into a high humidity, somewhat bright ... it's probably not what a lot of people would picture; it's not a dark cave or anything like that. They need some light. They need a lot of fresh air. So think like ... think a forest, think where you would find them. It's dappled light, it's high humidity, and it's a lot of fresh air. And so we put them in these specialized rooms, basically that we control the environment in, and then make slits in these bags, and the mushrooms just push right out. They grow right out of these bags, and then we harvest them right off of those, and then finally we are left with the stem material that works great as an amendment to soil or something, so we tend to work with other farmers to say, "Hey, take all this material that we're done with and put it back into your farm so you can grow more whatever kale, barley." It becomes sort of a closed loop, so we're not really throwing anything away. And how long does all that take? So anywhere from [crosstalk 00:15:21]. Depends on the variety a little bit. Oh, sorry [crosstalk 00:15:28]. It depends on the variety of mushroom a little bit. 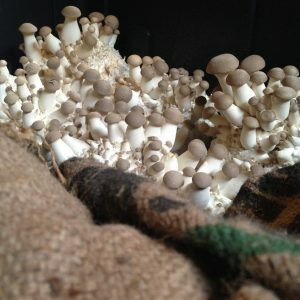 The most popular variety we're growing right now is called oyster mushrooms. They're a common kind of gourmet mushroom. They're a little bit different than what you usually see in a grocery store, not that kind of white, button mushroom. And to grow a round of oyster mushrooms start to finish, if we start like Chris was describing, by introducing mushroom tissue cultures to a substrate, probably from then to when we're harvesting is about six weeks. 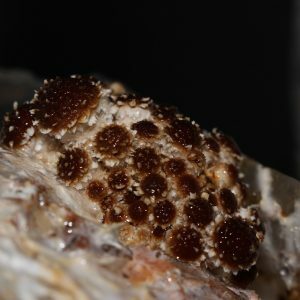 But once the substrate is fully colonized, the mushrooms get very tenacious, and they want to be growing, and so we can harvest a couple of times off of a block of substrate, and that will happen within two to three weeks. So we'll harvest, and then another round of mushrooms ... we'll get what we call a second flush, and we're able to harvest that again. It's just on the cusp of this giant leap into scaling, and I think you mentioned before just trying to navigate the how do we grow and how do we scale? We're not taking baby steps. We decided we were just kind of going to go for it because we didn't want to be in [inaudible 00:17:08] of leasing a medium sized space for a couple of years and then having to move the whole operation a couple years after that. We decided we're just gonna try it, either do great or fail fast. And we're right on the cusp of figuring out if we're gonna fail fast. So we'll see. You won't. You won't fail. You won't fail. [crosstalk 00:17:31] You guys are superstars. Well, thanks for saying that. The process of growing them ends up being a lot ... it's almost a manufacturing process, and it would be much more familiar to someone who'd been to a beer brewery. It's actually kind of similar to that. When you brew beer you're taking a fungus, which is your yeast, and you're introducing it to the sugary liquid and then it turns into beer; it ferments. So it's really similar to that. It's a production cycle. It's [inaudible 00:17:59] and being in Detroit, which is the great manufacturing city, it feels fairly appropriate. This is so fun. Now mushrooms are a delicacy in many, many places. How does that play into the story or the marketing or ...? Yeah, they've been ... and I feel like even recently they've become a little bit more popular. I think we've been fortunate to hit the market at a good time when people are being really conscious about, not only where they're sourcing their food but what they're eating, and so, Chris and I are both vegetarian, so mushrooms have been a big part of our diet just as an alternative protein. But more and more, I think because there are so many adventurous cooks and chefs in the area, who are interested and offering healthy options or vegetarian options, people seem really excited to see different varieties of mushrooms that maybe they can't access through their large food distributors or through kind of a generic grocery store. So we've been really surprised and pretty in awe of how excited people are if we say, "Oh, we're kind of trying this new variety. Do you think you'd want to try it? Some ones that you maybe would never have seen." It feels like a good time to be in the mushroom game. Maybe cut meat and cut other higher fat things from their diet. And so mushrooms tend to be pulled in as a good meat substitute, to kind of have that umami quality to them. Yeah, yeah. And so that kind of makes another, I guess, impact circle here, because you're sourcing all these sustainable materials and closing the loop with your output, or your waste, if you will. I love all that. And then, mushrooms are just healthier, aren't they? They are, and I think that's a nice way to round out. You know, one of our favorite places where we sell is with the Grown In Detroit Co-Op at Eastern Market. So from April through October, there's a co-op of growers that's organized by a nonprofit called Keep Growing Detroit. And a portion of that nonprofit facilitates the cost of growers selling at Eastern Market. But they take care of all the overhead, so we're not in charge of our stall fee; we don't have to be there every week. It's a real point of entry for smaller growers to get their produce in front of Eastern Market shoppers. And we have sold out of mushrooms every time we sell at Eastern Market. And I think that that also speaks to Detroiters just being willing to try either foods that are unfamiliar to them, or being really specifically sourcing the foods that they know are healthy. My favorite is giving the mushrooms directly to Detroiters, who are our neighbors; that's what feels the best. Really direct, you know. It's like, "I grew this, and now you're going to go home and eat it." And people will come back tell us how they prepared it, and that starts to feel like real food community, which is what I get really excited about. Yeah, yeah. I think people don't realize how much of a food community there is in Detroit. I mean, I think when I talk about it, I think the Eastern Market has a really big influence on that. I think it's become such a destination. But I don't think people realize how many good foodies there are both putting output and consumers. It's a real culture here. You know, button mushrooms are everywhere because they're very easily industrialized; they ship really well, they last a long time. Some of these ones, they just don't last on the shelf, so if we can play our part in making the food scene in Detroit a little more interesting by bringing strange mushroom varieties to these chefs and say like, "Do what you can with it. You may have never used it but just let us know how it goes." That would be really exciting and, you know, we've been humbled by how difficult the whole process is, so we're setting our sights appropriately, but that's sort of the goal, is like let's really try to bring a lot of variety to the scene. Super fun! How did you guys figure out how to price this kind of item? I think that's always a quandary for social entrepreneurs when they have a niche product. Yeah, I forgot there's a cliché, there's like three different ways of collecting your pricing; I've forgot how the cliché goes. But one of them is basically you kind of randomly select. And I think that's maybe the method of how we landed on it. We kind of just used into- I don't know, Deanna, was there more to it than that? I mean, I think there were a couple of back-of-the-napkin calculations, like, "Oh, how much did it cost when we bought that, that one time?" And I think the biggest quandary for us has been trying to put a price on our time. Because there really is pretty low overhead day-to-day for our operation. You know, we get a lot of our materials given to us because they're waste products from other businesses. There's a couple of very high-dollar things, like the real estate piece in getting into this building. But once we're operational in the warehouse, day-to-day inputs are low, but it's very time intensive. So Chris currently works full time and helps manage the farm. I just recently left my full-time job to try to manage the farm full-time, and I've been stunned at how it will just expand to fill the time I give it, all of the chores for the farm. I kind of thought, "Oh, this is going to be a little break for me. You know, I'll farm in the morning, and maybe pursue hobbies in the afternoon." And that really smacked me in the face. So the pricing I think, it lands somewhere between kind of pulling it out of thin air and just being conscientious shoppers ourselves. I mean I just happen to be someone who loves food so much that I get excited to go to the farmers market and see, "Oh what's this person selling and what are they selling it for?" So I think I was maybe a little bit more literate of food costs than potentially the average person. Certainly not a chef or someone who's doing inventory at a restaurant. But what I noticed is you can get button mushrooms, which are those industrialized crops, dirt cheap. I mean, those are selling for $1 a pound, $2 a pound. And they're either imported from China, or they're grown in Pennsylvania, which is the button mushroom capital of the country. They have these huge farms there that are producing millions and millions of pounds, and just shipping them all over the country. So we knew right from the get-of, we were never going to be competing on that. We can't compete on price, especially for kind of a more basic mushroom. So we set our sales rates at between $10 and $12 a pound wholesale, depending on the variety. And it's a little bit more retail; we do sell at one retail location, The Farmer's Hands, which is kind of a boutique grocery store in the Corktown neighborhood of Detroit. And I think it's been a learning curve. I think our prices work for us right now, and I think we'll learn a little bit more as we scale. Hopefully. I think what we're banking on is that our cost will actually go down, save the cost of starting up in the building. So then it will be an even higher profit margin. I don't know, do you agree with that Chris? Did I just invent that? No, I think that's fair. Yeah, I mean, we can't compete on price because we're small. So we have to compete on things like quality and service. And we truly are friends with basically every one we sell to. So, you know, that's an advantage that you know, people ask, "Hey, who are your competitors?" And someone could swoop in tomorrow and set up a mushroom farm in Detroit if they wanted if they just had lots of money. But there's a, you know, we truly live here; we truly know these people and our friends; so that's something that's not easy to pull out of thin air. Like, no amount of money can necessarily reconstruct something like that. So that's something that we really value. And especially as we grow, as we scale, I'm sure we'll be looking at our pricing level and always, always learn; always try to iterate kind of an ethos. I love it! I love it; I love it. Well, I am glad that we just talked about this pricing the time into it. And we have done the same thing at our company where, you know, you're just pricing the cost of the basic things, but you're not putting the time costs into it. Especially the founders don't put their own salary in there or costs in there. Because gosh, you're just working around the clock, so it's sort of hard to grab that price. But it is good. It always costs more than you really think it does, because the mistake so many entrepreneurs make at basic sustainability is not pricing their stuff high enough. And, it's tricky when you're in a niche because there's not a set way to do. It's like a little bit of an experiment, of what the market will bear combined with what your real costs are to survive. And I think it's an ever-changing landscape, you know? Exactly. It definitely feels like an experiment, and I think, you know, with our situation, we sometimes fantasize about when we will finally move this operation out of our home, because another thing that I struggle with like you were saying about kind of managing our time investment, we live in our farm. And so it's not like we're ever off the clock. We can wake up at, you know, six in the morning, do something for the farm. Chris will do some of his day job, but then he's stand up for 15 minutes and come back. So I think an area where we both really hope to grow is really kind of locking down what our time investment is and then figuring out how do we monetize that. What is my time worth. You know, because right now, it's just how I spend all my day, so it's hard to step from it and say, "Well, what should I be getting paid for this? What will success look like if I get a paycheck from myself?" You know, that whole concept of writing myself a paycheck still feels very far in the future. But I'm excited for when that day will come, definitely. Right. Some people feel shame over paying themselves a paycheck when they love their work so much. And we're always trying to encourage like, "No! You've got to pay yourself." No, I can't wait to pay myself. I think that will feel like real success for us. You know, because right now it feels like a glorified hobby. And I think it's been important that we talk we're a business, and we treat ourselves like a business, because we had to take ourselves seriously in order for anyone else to take us seriously, but now we're waiting for everything to follow and for things to kind of fall in line. And for us to scale in a way where the numbers will appeal to investors. And we're just entering that world of approaching lenders to help with our building renovation, and that's been its own whole set of, you know, educational experiences, certainly, but also really making me focus on the numbers much more. Which I'm grateful to be doing; I think I feel more confident as a business owner,that I can speak to what our costs are. Whereas before if someone asked me I would kind of just say, "Oh, you know ..." It feels better to speak with some authority on this business that we're trying to run. Yeah, it feels empowering. You know, it's happened to me, we used to have a saying around here, I used to say it, in the beginning, a lot, of our company's beginnings, and like, "This is such a fun job; it's going to be great one day when I'm paid for it." Yeah! Exactly. You should get a T-shirt made with that. All right. Well so, the immediate horizon is getting this into the warehouse and getting that setup. And then if you let yourself dream big of what your truth is of this moment, what could this go off to be like? What could be a big dream about this? Sure. Well, I think it will be fun to hear both of ours. Because I know Chris and I come at this from slightly different directions, and I get really excited when our two perspectives connect. So, Chris, do you want to go first and share what your dream is? Sure, yeah. So, I think, something we would like, you know we own this warehouse that we're trying to renovate, surrounded by a lot of empty space, empty lots full of garbage, and you know, not in the best shape. So I think something that is maybe attainable in the somewhat short to medium term would be, taking the stuff that is just going to waste, you know, nothing's been happening in this building for many years, making it useful again. Maybe cleaning up some of these lots, putting them to use. Just, you know, using the resources that are there for good again. Personally for myself, yeah, I have a background as a software engineer. A lot of my jobs in my past involved sitting at a desk for eight to all of the hours in a day, and it's just kind of all or nothing; either I'm in an office working that kind of job, or I have no kind of job, and I'm trying to start a mushroom farm. I would love to find a middle ground. You know, I don't want to leave technology behind; I've actually built a lot of, we call ourselves an open-source mushroom farm. And so, I've built a lot of software, put together a lot of things like Arduino and Raspberry Pi and sensor networks to try kind of merge the technology and the farming. And we've met a lot of people who find not very interesting. They're like, yeah, I like a soldering iron in my hand and a computer. But I also like getting my hands dirty. And, you know, that's me. So I would love to find something where we could even potentially bring people on, where, "Oh, you're coming at it from more of the agriculture side? Well, would you like to come on and maybe work with us, help us out on the farming side, but then maybe cross-train on some of this technology side?" And find people who are maybe more on the technology side and say, "Well come on in. Part of your job is going to involve, you know, moving mushroom blocks around." You know, it's not all one or the other, it's some sort of hybrid. And just like, if you can come in every day and your job is interesting and challenging, then that's the kind of job I would always want. Wow, that's great. That's great. And that connects so well with what my goals are because I get really excited when I start thinking about venues for taking on employees, which, when we're in this new space we definitely will. With a background in teaching, I taught middle school, high school, and also did some teacher coaching for a long time, so I love thinking about how people best learn and what makes people motivated to want to learn. And I think there is an intersection between that and the need for job creation in the city that will really feel empowering for people. Like, one of the things that we really love and admire about Rose's Fine Food, which is the restaurant that we sell to the most, is that from the beginning, when they were a startup restaurant, and they've just had their third birthday as a restaurant, from the very beginning they said, "More than anything, we're committed to paying our staff a living wage." And I think if you come out of the gate with that, and you hold yourself to it, good things will follow from it. So I get really excited thinking about we could train people up to have jobs that are fulfilling and interesting and diversifying their skillset like Chris was saying. You know, maybe on a Monday you're shoveling grain, but on Tuesday you're learning to write a software program. And I also get excited about how that could kind affect the greater community. I like the idea of our farm eventually being an education zone where we're hosting school field trips and doing some hands-on science. Our warehouse is right around the corner from a K-8 elementary school in Detroit, and I've reached out to some of the teachers there, and we've just in the early stages of talking about what an attractive science field trip would look like for them and how we might be able to offer that moving forward. And then if I dream really big, I think, "Hey this model kind of has something to it. What if we replicated this throughout some of these other Rust Belt area cities that are dealing with similar challenges, where there's vacant real estate that's a little bit obsolete, where there's some areas of food insecurity where people are depending on, you know, convenience stores and liquor stores and maybe don't have direct access to fresh healthy produce. What if we just took this model and made, I don't know a Cincinnati Mushroom Factory, or a Cleveland Mushroom Factory? Or see if we can scale it in that way and help empower other communities that are having similar, I don't know, the word "revitalization" is a tricky one for me, but, that are having a similar moment in time as Detroit is. So, if I think 10 years down the road and there were three Mushroom Factories throughout the Midwest, I think we would feel really proud and like we had done more than maybe we even thought was possible. Oh, yeah. Well I love this idea; this is so fascinating. You guys are a great team, and it's been really fun having you on the show. How would people reach you on social media, or do you have a website? Yeah. Thanks for having us too. 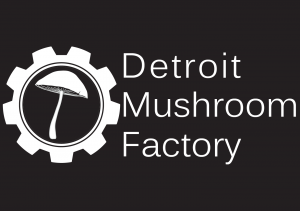 So people can reach us, we're just Detroit Mushroom Factory on all of our social media: Instagram, Facebook, and then if people want to get in touch directly, our website is DetroitMushroomFactory.com, and it has links to our email addresses there. We are really interested in what people think, and if people have suggestions, we love to kind of go back and forth with people on Instagram or on Facebook or on the website if people are curious or they have suggestions. We have given a couple local workshops on home mushroom cultivation, and we'll have more of those coming throughout the fall and then in the new year. And hopefully, we'll be hosting them at our new space. So there's some things to look out for from us, for sure. Ah, so fun. Oh my gosh. I can't wait to see what happens. I'll be coming by your place and checking it out in person. All right! You're welcome, anytime. Thank you so much for having us, and for asking all these great questions. Until next time, keep those bonfires burning! Give us a question to the mailbag!